CIEE is a volunteer organization. We came to Manyo park as volunteers from Italy, Vietnam, Mexico, and Japan through this organization. In the work camp, we mainly prepare many events, clean facilities, and take care of insects and plants. All of us really enjoy doing such activities as volunteers because all of them are really wonderful experiences. We also learn many things through this project and thanks to all the staff of Manyo park, we have a lot of fun every day. Ｈｏｌａ　ｓｏｙ　Ｃａｒｏｌｉｎａ　Ｐｅｒｕｓｑｕíａ　Ｈｅｒｎáｎｄｅｚ，　ｒｅｓｉｄｏ　ｅｎ　ｌａ　ｃｕｉｄａｄ　ｄｅ　Ｔｏｌｕｃａ　ｅｎ　ｅｌ　ｅｓｔａｄｏ　ｄｅ　Ｍéｘｉｃｏ，　ｔｅｎｇｏ　２８　ａñｏｓ　ａｃｔｕａｌｍｅｎｔｅ　ｓｏｙ　ｐｒｏｆｅｓｏｒａ　ｅｎ　ｌａ　ｕｎｉｖｅｒｓｉｄａｄ　ｄｅ　ｍｉ　ｐｒｏｖｉｎｃｉａ．Ｄｅｓｄｅ　ｑｕｅ　ｅｒａ　ｎｉñａ　ｍｅ　ｅｎａｍｏｒé　ｄｅ　ｌａ　ｎａｔｕｒａｌｅｚａ，　ｅｓ　ｐｏｒ　ｅｓｏ　ｑｕｅ　ｎａｃíｏ　ｍｉ　ｉｎｔｅｒéｓ　ｐｏｒ　ｌａｓ　ｃｕｌｔｕｒａｓ　ｑｕｅ　ｔｉｅｎｅｎ　ｕｎ　ａｒｒａｉｇａｄｏ　ｒｅｓｐｅｔｏ　ｐｏｒ　ｌａ　ｎａｔｕｒａｌｅｚａ, por esa razón decidí venir al parquet Manyo como voluntaria durante las vacaciones de verano. Hello, I am Caroline from Mexico. Twenty eight years old, nowadays I am working as a Chemistry Teacher at my home town's University. This time I came Masuda to join the volunteer project at Manyo Park. Since I love nature, through this volunteer activities I want to enjoy japanese nature and know more about the real japanese cultere. It will be funny, nice to meet you. My name is Beatrice Rossetto, I am 20 years old and I come from Italy. In this period I am studying japanese at university, I've just finished the second years of study. I've always wanted to come to Japan. I like its culture, and I wanted to get in touch with it from a different point of view than Tokyo or another big city, so when I found this project for me! Since I love nature and animals, especially bugs, I like staying here, and moreover, this volunteering job helps me to improve my japanese capability. I'm so happy to be here at Manyo park project! I hope to do a good job here, and to be helphul for this workcamp! Konnichiwa! I am Vi from Ho Chi Minh city, Vietnam. I am 21. I have liked Japanese language and culture since I was a little and have studied Japanese for 3 years. I like to practice kendo and swimming. I also really like Japanese food because it is very delicious and not spicy at all. When I am studying at my university, I always want to see the real Japan, not just through the books or teachers. Japanese culture seems to be well-reserved and the peoples seem very friendly and quick. I want to see the renowned Akita/ShibaKen too. Therefore I was extremely happy when I had the chance to do volunteer in Manyo park. There are 2 things I am interested in the program, which is homestay and working in a park. I think spending time with my Japanese family will be an unforgettable experience. I was very curious about the work in Manyo park, like taking care of the insects and preparing for cultural events, too. I hope that when the program finished, I will able to bring many happy memories back to my home as well as give many happy memories to my Japanese family and friends. A través del voluntariado en Manyo Kouen, no sólo tuve un acercamiento con la naturaleza de la provincia de Japón, también corroboré que algo que escuché en alguna clase del bachillerato: la cultura de los pueblos se vive y se reescribe a diario, por medio de pequeños instantes, aunque quizá sean los que olvidemos con facilidad. Además, encontré nuevas amistades que atesoraré siempre. Gracias a las personas que conocí en Masuda aprendí que la mejor manera de retribuir a la amibilidad recibida es actuar igual, no sólo ser recíproca con quienes le dan un trato amable a uno, sino también abrir las puertas de mi hogar a extraños, y así como encontré un trato amable en cada sitio, a mi vez puedo ser más cálida y siempre con las personas que se crucen en mi camino, cada rostro que vemos en la acera tiene una historia que contar, de la cual podemos aprender. Me siento muy afortunada de haber pordido vivir esta experiencia, ¡gracias a todos! Through the Manyo park volunteer program I not only have been able know a little about and to enjoy of the Japanese nature, I also learnt that culture is not just a word or something to study about in class, all the people are madding it every time, I learnt that life is complete with too many small instants, which maybe we will someday forgot but which made it funny. As well as I found new friends, that will esteem forever. Thanks to every one! At the end of these two weeks in Masuda I would say I'm happy of this experience, mostly because I think it different than just come in Japan to see some cherry blossoms and visit Akihabara. I mean, this I also something I did and I enjoyed, but since we all have the opportunity to see a country even from another point of view, I would suggest to anyone to get this possibility. Dopo aver passato queste due settimane a masuda mi sento di consigliare il campo a chiunque abbia voglia di scoprire il Giappone non solo guardano qualche fioritura di ciliegio e girando Akihabara. Voglio dire, anche io ho fatto queste cose e le ho apprezzate molto, ma penso che poter visitare un paese da tutti i punti di vista non sia un'occasione che ci si presenta tutti i giorni, e quindi il mio consiglio è di coglierla al volo, e partire. The workcamp was over much sooner than I thought. Time flied so fast with busy work as well as sightseeing activities. It is kind of sad not able to say “Ohayou” to everyone anymore. I was very lucky to be able to join this amazing workcamp, experience an amazing Japan and meet many amazing people. The people in Shimane make me feel very welcomed and comfortable. Everyone is very busy with their work yet they are always patiently helping us volunteers. 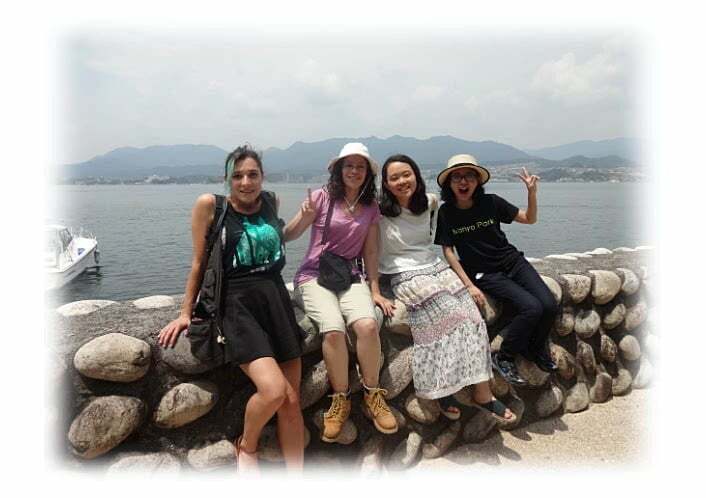 Other volunteers, Ayumi-chan, Bea-chan and Carolina-chan were super friendly, thoughtful and hard-working. I had so much fun working as well as hanging out with them. I will always remember this as the one of the best memorable experience in my life. The first time I was in my favorite country. I also hope that I can come back and visit my Japanese families in Masuda soon too. Trại hè đã kết thúc sớm hơn nhiều hơn tôi nghĩ. Thời gian trôi qua rất nhanh với công việc bận rộn cũng như các hoạt động tham quan. Khá là buồn khi không thể nói "Ohayou" với mọi người nữa. Tôi đã rất may mắn khi có thể tham gia workcamp tuyệt vời này, trải nghiệm một Nhật Bản tuyệt vời và gặp nhiều người tuyệt vời. Người dân ở Shimane làm cho tôi cảm thấy rất hoan nghênh và thoải mái. Mọi người đều rất bận rộn với công việc của họ nhưng họ luôn kiên nhẫn giúp đỡ tình nguyện viên chúng tôi. Các tình nguyện viên khác, Ayumi-chan, Bea-chan và Carolina-chan siêu thân thiện, chu đáo và chăm chỉ. Tôi đã có rất nhiều niềm vui làm việc cũng như đi chơi với họ. Tôi sẽ luôn luôn nhớ điều này như là một trong những trải nghiệm đáng nhớ nhất trong cuộc đời tôi. Lần đầu tiên tôi đến đất nước yêu thích của tôi. Tôi cũng hy vọng rằng tôi có thể sớm trở lại và ghé thăm các gia đình Nhật Bản của tôi ở Masuda.